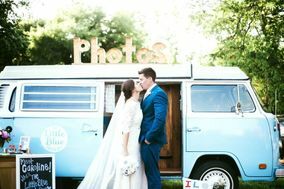 The little blue photo bus was such a hit at my wedding! Kasi was super helpful in coordinating it's arrival and very responsive to emails. Book Caroline for your wedding, all your guests will be happy! Everyone had a great time with the little blue bus! I loved it and I am so glad we had it at our wedding!! Absolutely loved working with this company!! Such a fun thing to add to our wedding!! Everyone at the wedding loved the little blue photo bus. The wedding was in May and the guests are still talking about how awesome the bus was. I highly recommend it. 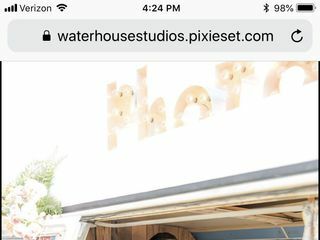 From the time my husband and I booked The Little Blue Photo Bus, Kasi and her husband went out of their way to give us everything we wanted for our special day! They were one of the best vendors to work with and by far the best money we spent on the entire wedding! Worth every single penny because the guests LOVED them! Don’t waste money on any other photo booth because this will be the best one out there with the best people to work with! Thank you so much Ashleigh! It was such a pleasure working with you and we appreciate your business! We absolutely loved having the little blue bus at our wedding! Not only did it make for the best guest book ever it was a beautiful decor piece! This was our first time using them but will def not be the last! Recommend to everyone. Thank you Anna! I LOVED your guest book! We really wanted a unique photo booth for our wedding and my husband is an avid VW fanatic so this was perfect. We loved this bus and so did every one else! Super easy to work with and very professional. Arrived early and set up and we were beyond happy with their service. This Little Blue Bus brought a smile to everyone's face at our wedding and we would highly recommend them! They even printed us a book of all of the photos taken in the bus as a keepsake. Thanks again! Our guests loved Caroline and the team! It was a wonderful interactive photobus for our wedding day and they made us such a beautiful and personal guest book to remember our day! The Little Blue Photo Bus was a total hit at our wedding. It added such a unique touch! Kasi and Derek were wonderful to work with as well! Would highly recommend them for any occasion ! This photo bus was amazing!!! Our wedding guests raved about it and had pictures to remember their night! We really enjoyed looking through the book of photos after the wedding. It was great seeing how much fun our guest had. Some pictures were hilarious! This was AWESOME! The Little Blue Photo Bus was a HUGE hit at our wedding. Our family and friends are still raving about it. Our favorite photo strips are still on our fridge. I'm so glad we decided to go with The Little Blue Photo Bus.